"The service receptionist was extremely helpful, and very professional." Read our customers' honest and impartial Land Rover Range Rover Sport car reviews and ratings to easily find your next car at Motorparks. Good looking and comfortable car. Drives very smoothly and quietly. Can't always tell when the engine is off until you hear a cough as the starter motor restarts it. Good performance in drive and even better in Sport mode but if you switch to EV mode it's very sluggish off the line, even if the engine is running. It's a very 'mild' hybrid, but useful extra power from the electric motor, and it's fun trying to see how far you can get in electric mode. Slightly reduced boot space for the hybrid. Lots of nice features but I miss the dashboard shelf that my old Range Rover Sport had for storing sunglasses within easy reach. The touch screen is quite slow to react to commands and heated seats are slow to warm up, but has an excellent sound system and I like the heated steering wheel. Delighted with my Range Rover Sport HSE, quiet, smooth and powerful V6 engine with reasonable economy makes for thoroughly enjoyable relaxed driving with the confidence to deal with all on and off road conditions. Ticks all my boxes! I purchased an Approved Used Range Rover Sport from Grange Welwyn. The sales process was the easiest and most enjoyable of any car purchase I have ever made. The car was exceptionally well prepared and came with the peace of mind of 2yrs full warranty. The only downside was that cars seem to be promoted on websites and internal systems with random option lists, so ensure you double check the options before you buy. Loving the car, it truly is an amazing vehicle. Looking forward to the next purchase already. So happy with my new RR Sport SVR. The car is fantastic, looks and sounds amazing, and drives like nothing I've ever had before. There is so much tech on the car I am still learning new things. Having owned many Land Rover vehicles, this RRS is by far the best. If you need a vehicle to tow, carry loads of gear, go off road and do long journeys, then I can't think of a better car. The 'dynamic' model makes the handling incredible and I'm still getting 35 mpg. Absolute pleasure to drive, beautifully finished, gorgeous interior and looks fantastic. Drives like a dream, I'm enjoying being higher up than in a car, kids love heated rear seats, boot opens automatically which is great when you have your arms full of shopping. I would grade this car excellent all round. This is my second Range Rover Sport, they are addictive and once you've had one it's hard to live without one as many people say - I doubt this will be my last! It's an amazing car that I enjoy driving as much as I enjoy the anticipation of driving it. The engine is smooth and responsive - put your foot down and the resulting roar and surge forward makes the hair raise on the back of your neck. My kids love the toys - the meridian sound system is particularly good and full of base. My wife loves the finery of the whole car. Finally I'm looking forward to the complimentary Land Rover Experience Day as, so far, haven't had much cause to press any of the tantalising off road function buttons that stare at me everyday. 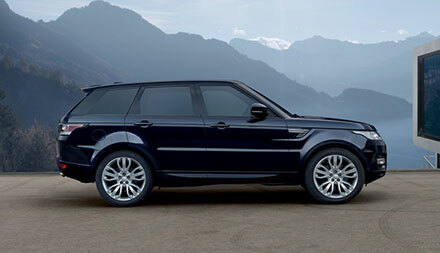 This, the Range Rover Sport, is a car that suits our every need. A family with a small child, a dog and we love to enjoy the outdoors, this car allows us to do just that with ease and in style and luxury too. We are delighted with the new Range Rover Sport, very comfortable, well built, spacious, fantastic drive, excellent choice, overall 100% very pleased we could not have made a better choice. Thank you all at Grange Woodford. Range Rover Sport, absolutely amazing car can't fault anything about it.